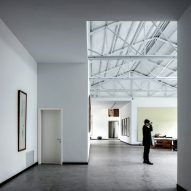 A former factory in Beijing has been overhauled to create a studio and home for a calligraphy artist, featuring bright white galleries and a sloping roof with stepped windows. 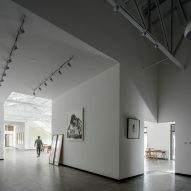 Office Project transformed the former industrial building in Beijing's Huairou District for artist Xu Hongquan, who practices both eastern and western art techniques, as well as writing and teaching. 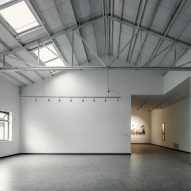 The architects wanted to create a blank canvas for the artist to display his work inside the six-metre high structure. 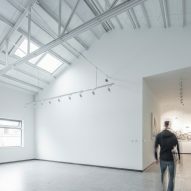 Inside the building named Hall within Cloud, the walls, ceiling and existing truss roof structure are all painted white to create bright galleries. 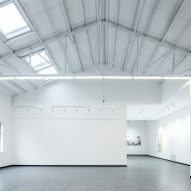 The building's outer brick walls have also been rendered and painted white. 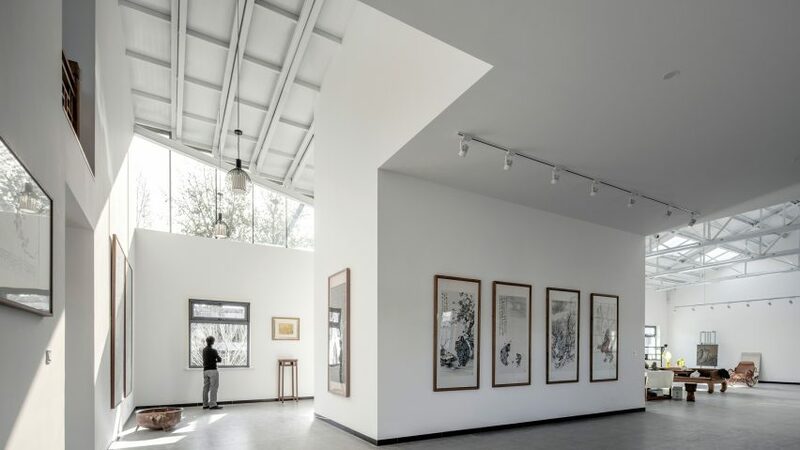 A new steel roof lifts on one side to create a two-storey block for the artist's home, while the galleries and a tearoom occupy the other side of the building. 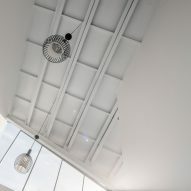 Stepped windows slot into the rising gap between the existing wall and the new roof, bringing plenty of light into the open gallery space. 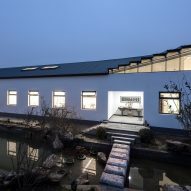 When it rains, the architects hope that the slope of the roof will cause water to sprinkle into the yard in front. "At first we were going to make the top a purely hyperboloid [form], but as the limitation of manufacturers craft level and cost, we chose the segmented folding roof form finally," they said. "We imagine that in the rain raindrops will fall on the slow and steep roof, and then gently sprinkle on the yard." As the roof flattens, the windows progress into a thick band to offer the artist views to the outside from his master bedroom and study. 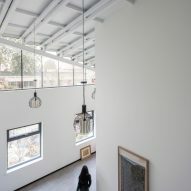 "Due to the site being surrounded by forest, Mr Xu hopes to move the bedroom and study to second floor, so that the beautiful scenario outside the window can be caught," said the architects. 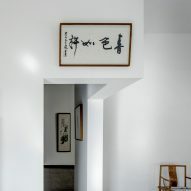 Rather than corridors, visitors move from one gallery to another to enable views between different areas. 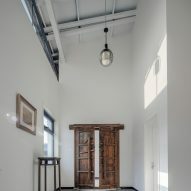 A small opening in the new upper floor offers the artist views from his bedroom into the galleries. 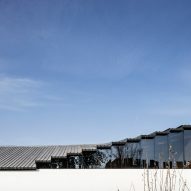 A number of factories in Beijing are now being adapted for domestic use. 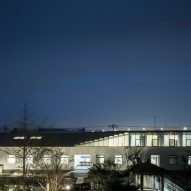 Other examples include a former missile factory that Neri&Hu converted into a cafe and car repair garage, while Origin Architect turned an abandoned printing factory into a theatre complex.